NAPLES, Fla. (Sept. 30, 2015) – Wegman Design Group received the award for best interior design of a healthcare facility at the Collier Building Industry Sand Dollar Awards gala which took place on Sept. 26 at the Ritz-Carlton Tiburon in Naples, Fla. This prestigious honor was for their work at Discovery Village at Naples, Southwest Florida’s newest and most advanced senior community. The Wegman design team was recognized for fulfilling the vision of Discovery Village: to create assisted living and memory care residences, dining areas and social spaces that reflect the community’s lifestyle and encourage residents to enjoy a multitude of amenities. 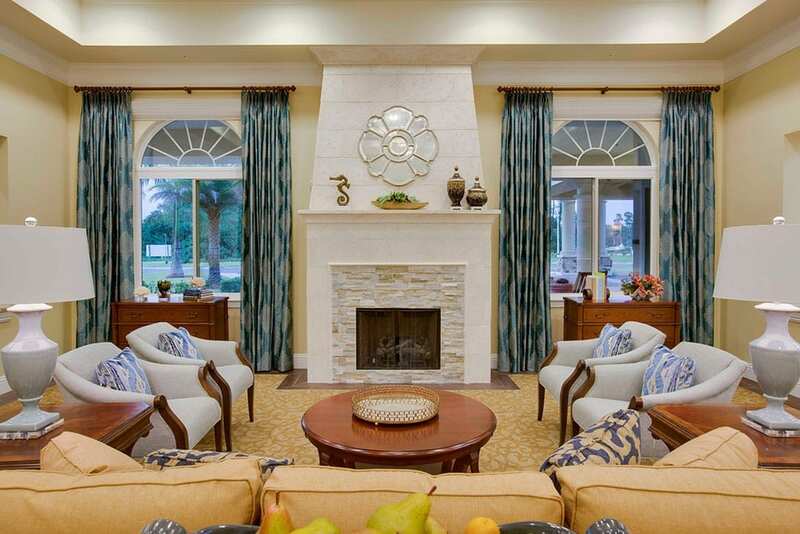 Wegman Design Group modeled each Individual Assisted Living resident room after apartment-style living. In the 30-bed Memory Care residence, the design was focused on the goal to promote physical and mental wellbeing, and to create social opportunities. Throughout the 120,800 square foot space, the design team selected finishes for wall coverings, a custom mural and decorative lighting as well as furnishings, custom mill work, artwork, interior signage and accessories. The Sand Dollar Awards are presented each year to member builders, developers, architects, remodelers, interior design firms, landscape architects, trades and marketing, sales and/or advertising professionals who have demonstrated building, design and marketing excellence in the Collier County area. The coveted Sand Dollar Award, the highest accolades given by the Sales and Marketing Council of the Collier Building Industry Association, are presented annually at the September gala. The awards are presented to the winners as a result of onsite judging by experts from across the State of Florida. For more information visit www.WegmanDesignGroup.com. As the area’s newest and most advanced senior-living community, Discovery Village At Naples is nestled not far from the natural beauty of the Everglades and the Gulf of Mexico. Unlike most assisted living communities in the region, Discovery Village At Naples uniquely blends the best senior-living features, amenities and wellness programs all into one state-of-the-art community. Residents are well taken care of by a team of professionals offering the ultimate in comfort, happiness and healthy living. There are three lifestyle options: Independent Living, Assisted Living or Memory Care. At the heart of this brand new community is The Grande Clubhouse which offers gourmet dining three times a day, social opportunities and an array of events and activities. The wellness center encompasses an indoor heated therapy pool, fitness center, available on-site therapies, and on-site Medical Director, plus many other features to help residents get well and stay well.